Clark Construction Company has long recognized the importance and value of employing construction and design practices that conserve resources, reduce waste, and create healthier and more productive built environments. Being an early adopter of environmentally responsible building techniques such as total project waste recycling and reutilization, Clark Construction Company has forged new partnerships and a reputation for strong environmental stewardship. This commitment to environmental excellence has culminated in the adoption of some of the most advanced building processes and techniques. on all of our projects to recycle all debris at recycling centers, thereby minimizing the impact on landfills, forests and the environment at large. Specific areas of implementation on current projects include recycling 50% of all materials removed from the site and requiring a minimum of 5% of the new building materials must be of refurbished materials. 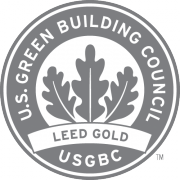 Our green building team of LEED accredited professionals is continuously researching and implementing new green products and technologies that save initial construction costs and reduce on-going energy consumption. This provides our clients with the information and options to build sustainability into their structure, and the experience to coordinate with our architect/engineer partners to provide the highest level of environmental design into the project. Clark’s Environmental Management Systems (EMS) approach is among the industry’s most comprehensive for managing safety and environmental issues. By taking advantage of the latest technology and sustainable building materials, your next facility will not only make less of an environmental impact, but it will also result in lower construction costs and reduced ongoing energy consumption.